All the President said was “We’re going to start saying Merry Christmas again”. Eight little words. And the media went crazy. This, of course, is all hilarious. 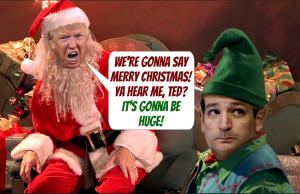 We tried to tell you what a beautiful thing Donald Trump would be to the ever-entertaining “War on Christmas”. Let the chaos reign. What is the media really saying here? Let us work this out for you. They are saying the War on Christmas is back. They will go ape-crap crazy with it this year because they can say now, “Trump started it!”. The media hates, hates, hates, hates Christmas. They always have. And President Donald Trump is just too delicious a target for them. The entertaining thing here is that Trump thinks he’s got the media’s number of this — and the media thinks the world agrees with them on Christmas. News flash, morons: The War on Christmas ended long ago and Christmas won. Christmas always wins. But this year there will be war anyway.